Canadians of Turkish origin gather once again to remember Colonel Atilla Altikat, on Sunday, August 29, 2010, between 3-5pm, at the intersection of Ottawa River Parkway and Island Park Drive where he was gunned down by Armenian terrorists and became the first victim of international terrorism on Canadian soil. 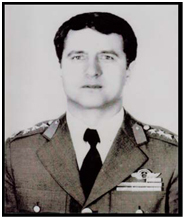 On the morning of August 27, 1982, while driving to work in Ottawa, Col. Altikat, the military attaché at the Embassy of the Republic of Turkey, was shot 10 times at point blank range. Armenian terrorist organizations claimed responsibility for the attack. In spite of some leads by journalists and others, no arrests have been made and the murderers remain at large. Candlelight vigil will follow around the Centennial Flame in front of the Parliament Building at 20:00 hours. Turkish Community hopes to see their friends, their politicians and Ottawa journalists on this remembrance day of all victims of terrorism.